Description: Acute calmness is all around you. 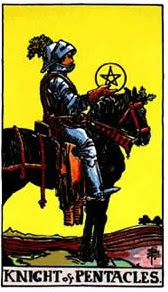 Knight of Pentacles is a tarot card of tranquility. No argument or thrill is involved here. This is because the knight does not have a desire to fight and also he is not on the move. For love and relationship, this heralds a time when the two lovers are following a very specific routine. In addition to this, they are completely certain that their relationship has crossed the limit of satisfaction level. What is unfortunate about this is the fact that somehow both of them are seeing it as too tedious. In other words, they are in need of some fun time. For some adventurous couples, the knight of Pentacles can represent a warning signal. This is because when everything becomes too predictable in a relationship one of the partners might simply start to think that grass is greener on the other side of the fence. Thus, he or she might begin to move away from his or her current lover. For feelings, Knight of Pentacles shows unwavering devotion. Now recall that the knight is not on the move. This can work in two ways for a love interest. In a friendship, he might simply be the best buddy because he thinks that by being reliable, he will be able to express what he has in his heart. But if he is a stranger then the Knight of Pentacles states that he is interested, but will not act on it easily. This is that one case where one has a crush on someone, but is preferring to stay quiet about it. Reversed Knight of Pentacles shows a time when the extreme tediousness makes the two lovers say, “We have had enough of this”. So it is possible for them to change their pattern of doing things. This can be either trying out something new or simply saying goodbye to the relationship. For feelings, reversed Knight of Pentacles enlightens the love interest to believe that his way is no longer going to work. Thus, he has to either bury his feelings or try a good method to express them verbally.